Cutting expenses to the bone is scary and overwhelming to most people. But when you’re deeply in debt and feeling lost and hopeless you begin to search for even extreme ways to shorten your everyday expenses list! While paying off debt, we cut these 7 expenses and found they freed up a substantial amount of money each month. I want to show you how to drastically cut expenses without feeling deprived on a debt-free journey! Living with debt can feel soul-crushing at times! It can feel as though you are drowning and constantly sacrificing things you want to do and buy just to make debt payments! Living on a budget can change the game for you! 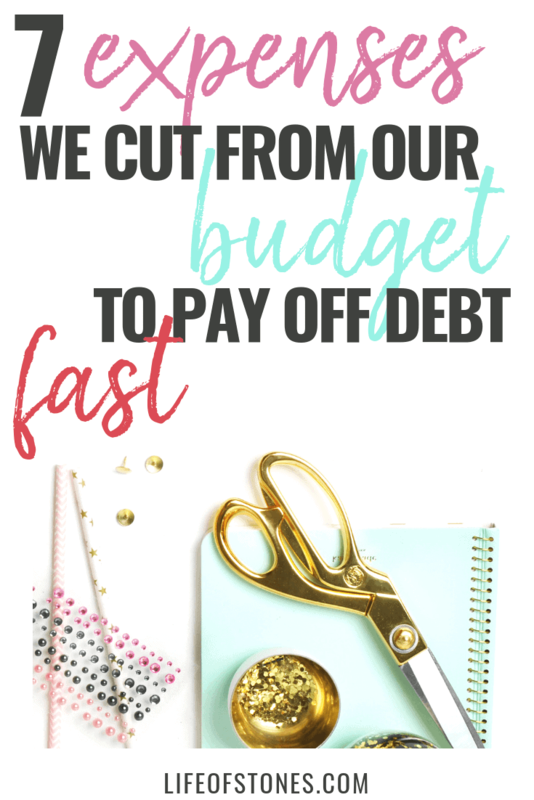 Budgeting is the one single action that finally helped us gain some major traction on our journey to getting out of debt and now we are completely debt-free except for our mortgage! 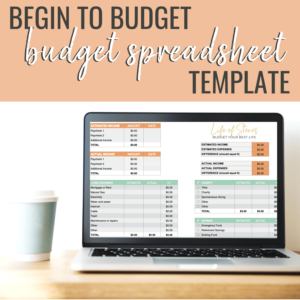 I used my exact monthly budgeting method that helped us pay off $55,000 of debt in under two years to create my Begin to Budget Bundle! 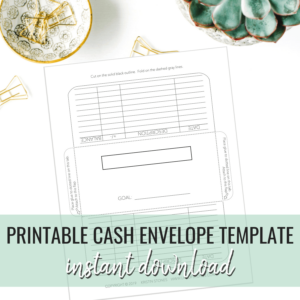 This is the same budget binder I use today and it will help you create a working budget you can actually stick to! 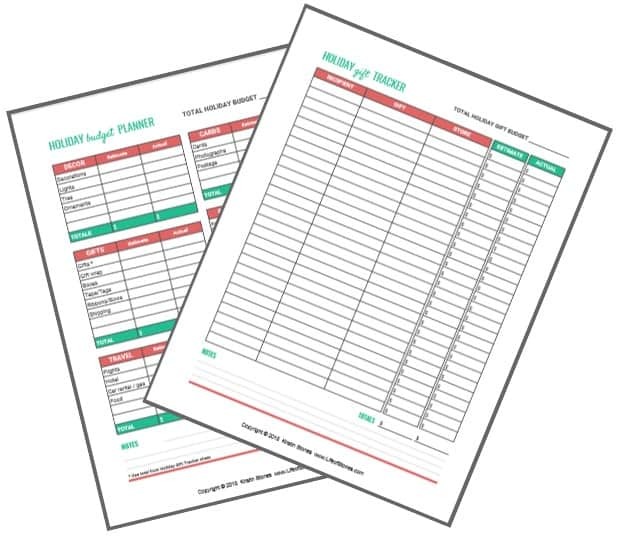 This 31-page printable budget binder will help you organize your finances, save money and get out of debt! In addition to consistent monthly budgeting, another way we fast-tracked our debt payoff was to cut spending! We cut most non-essential spending and tried to stick to our budgeted amounts for each category as strictly as possible! Of course, we made mistakes. A lot of mistakes. So will you and that’s OK! But we found that cutting these specific seven expenses gave us a solid boost in the amount of money we had left to put towards our debt snowball payment each month! When you are first creating your zero-based budget and you realize the numbers are upside down – meaning you don’t have enough money left at the end of the month to save, pay off debt or even cover your basic living expenses, you’re probably ready to throw in the towel. I’d even bet you assumed that the only way you’d be able to make the numbers work would be by cutting expenses to the bone…and who wants to live like that?? I promise you there is a better way! Exploring a more frugal lifestyle, finding creative ways to save money in your day to day, and committing to making a few substantial cuts to specific expenses that feel essential (but really aren’t) can make the world of difference and probably still keep you living quite comfortably and making some major progress on paying off your debts! While there are countless ways to save money in your budget each month, I mention these specific expenses because they are the ones I feel made the most impact on our bottom line! Trust me, I know you’ve heard this one before as it’s become quite popular recently, but have you ever really considered this as an option? Take a minute to pull out your current cable bill and have a look. I can almost guarantee you it’s over $100/month? #amiright It’s also likely that it’s bundled with additional services you may or may not need (driving your bill higher). Hulu Plus for current network shows, original content that definitely rivals Netflix (have you heard of the Handmaid’s Tale?? ), and children’s content. I haven’t had Hulu Plus for a while now and I hear they’ve really upped their game! You can get a free 30-day trial then it goes to $7.99 per month. They even have a brand new LIVE option where you can watch sports and a ton of network channels! Sling TV offers options for sports too as I know that it a big fear for many die-hard fans when they think of cutting cable. I’ve never used Sling so I can’t speak from personal experience but they do offer a free trial to try for yourself! Amazon also offers Prime TV included with your Amazon Prime membership! This includes a ton of free movies, TV shows, and children’s content, which is an awesome perk! Try a free 30-day trial of Amazon Prime to get all the perks and see if the shows and movies are ones you’re interested in! Already a Prime member? Then you already have access to Amazon Video BUT you can get a free 7-day trial of HBO while you’re at it! Amazon also has a great new program called FreeTime where you can get thousands of kid-friendly books, apps, and videos on your Android Fire devices! You can also try it for free for 30-days! As mentioned above, your landline phone is likely bundled in some way with your cable and/or internet. Probably the only reason you still have a landline phone is that your cable company threatens to raise your rate to a ridiculous an even more ridiculous amount if you break the bundle! It’s crazy to continue to pay for something you don’t even use! Stop letting the cable companies bully you into doing this! If you actually use your home phone than cool, go ahead and keep it if you’d like but if you don’t use it, don’t pay for it! Show them who’s boss. Be a rebel. Break your bundle. Cancel your cable. Cancel your landline. You will survive, I promise! And while you’re at it, check around and try to lower that cell phone bill that I can pretty much guarantee rivals your car payment (insert laughing emoji)! Call your cell phone provider and ask them for a rate reduction. Hell, threaten to move to their biggest competitor if they say no (but be prepared to really leave if they still refuse). While it can be a pain to switch, cell phone carriers are incredibly competitive and you will likely find an awesome deal if you do have to switch! Did you know you can even get cell service through Amazon these days? You can! Personally, we love using Amazon as a one-stop shop and being able to do so much through them because they always offer such a good user experience! We haven’t tried purchasing our cell phone service through them yet because we are happy with our current service, but if we consider switching we will absolutely check out Amazon’s cell phone and cell service programs! Plus, canceling your landline will also free up more money in your budget if you need to upgrade your cell plan in the process! Thankfully this habit kind of stuck with us through the years or who knows how much more debt we would’ve incurred in the process. And by dining almost exclusively at home while paying off debt, we saved a ton of money we otherwise would have thrown away at restaurants! I’m pretty frugal so the idea of spending $100 at a restaurant to feed our family of four only one meal when I can feed our family for an entire week for that same $100 just doesn’t sit well with me. But I know some people live for dining out so if you still crave that “restaurant experience” give a meal delivery service a try! Companies such as Blue Apron send you meal kits right to your doorstep that include a recipe/directions and all the pre-measured ingredients you need to make the meal! They have a ton of awesome plans and meal choices and not only is the food restaurant quality but the convenience is a great perk! I don’t know that it would necessarily cut money from your budget – technically that depends on what you currently spend – but it’s a great alternative to eating at a restaurant and definitely cheaper! It could be a great compromise to use a meal delivery service and host friends for a fun night cooking or a date night at home! You can save $50 over your first 2 boxes when you try Blue Apron! Oil changes can be pricey, no doubt. And while they aren’t an every day or even an every month expense, they are an expense you can easily cut by changing your own oil! I’m definitely NOT a car person so this one defaulted to my husband…but to be honest, he’s not exactly a car person either (don’t tell him I said that)! He asked a friend to show him how to do it and now he changes the oil in both of our cars each time, saving us a bunch of money! If you don’t have anyone to teach you how that’s ok…YouTube is your friend! You can literally learn anything from watching YouTube videos! Once you purchase some initial supplies, you’ll see significant savings each time you skip the mechanic and DIY your oil change! Yes, I do think it’s important to maintain some degree of social life while working to pay off debt but holy crap do you realize the markup of alcohol at bars and restaurants?? You can literally purchase an entire bottle of liquor for the price of 2-4 drinks at a bar!?! Why not host your pals at your place instead? Grab a few bottles of your favorites spirits and this nifty guide and you can be whipping up fancy cocktails in no time! I used to tend bar a long time ago and while I wasn’t exactly flipping bottles and lighting shots on fire, to this day I am almost always disappointed when I purchase a drink at a bar/restaurant and usually prefer the ones I make myself at home! If house parties just aren’t your jam, there is nothing wrong with a low-key night out every once in a while as you budget for it in advance! I’m not going to advise you in specifics on life insurance as I’m not licensed to do so. What I will say is that first and foremost you really need to be insured on some level. I will also say that insurance is a personal decision and many people have very strong feelings about it one way or another. Cashing in our whole life insurance policies was a huge factor in us paying off our debt as quickly as we did, but it certainly was not a decision we took lightly. It was stressed in this course we took in the very beginning of our debt-free journey and knowing both my husband and myself had a decent amount of cash build up in each of our policies, this caught our attention immediately. I highly recommend speaking with an insurance professional and counseling with knowledgeable people in your life who want the best for you. Contact an insurance broker (a broker works with multiple companies instead of just one) to be sure you are receiving competitive rate quotes. I also recommend reading this book, which discusses the reasons we cashed in our policies even further. If you decide to cancel your whole life policy in favor of term insurance (please be sure your term is effective before you cancel any insurance policies) you will have substantially lower premiums and receive your cash value back to you in a lump sum! I’ve saved the best for last! Aside from your housing costs, food is usually your highest monthly expense, which is why it is so easy to decrease! I can almost guarantee that with a few simple tweaks you can drastically cut your expenses in this area! Start by tracking your food expenses. Be sure to include every time you drop by the grocery store and any food items you toss in your Target cart throughout the week! If you’re surprised by the total at the end of your tracking period (I suggest tracking for a full month, if possible) then you have some room for improvement. If tracking your expenses reveals you already have a relatively low budget then you’re ahead of the game! I’ve been able to cut our grocery budget by over 50%! Plus we have saved thousands of dollars a year on groceries and you can too! Opt for meal planning and cooking at home instead. You’ll save a substantial amount of money and probably have a bunch of leftovers too! Meal planning is truly a lifesaver! Personally, I only meal plan our dinners each week, but many people find even more savings in planning 3 squares a day! Skip one lunch out and grab yourself a fun notebook – I LOVE this one – to plan your meals and soon enough you’ll be saving so much money you won’t miss those chain restaurants one bit! Feeling too strapped for time to meal plan each week? Check out my favorite meal planning service $5 Meal Plan! They are awesome! You get meal ideas for breakfast, lunch, AND dinner with easy-to-follow recipes plus a full shopping list for only $5 per MONTH! It’s easily worth at least double that cost! Give them a shot FREE for 14-days and even if you don’t decide to continue, that still gives you 2 full weeks of meals (for free)! Those are the seven expenses we’ve cut to pay off debt, but don’t just stop with these…get creative! I challenge you to run with these suggestions but also find other ways to scale back too! 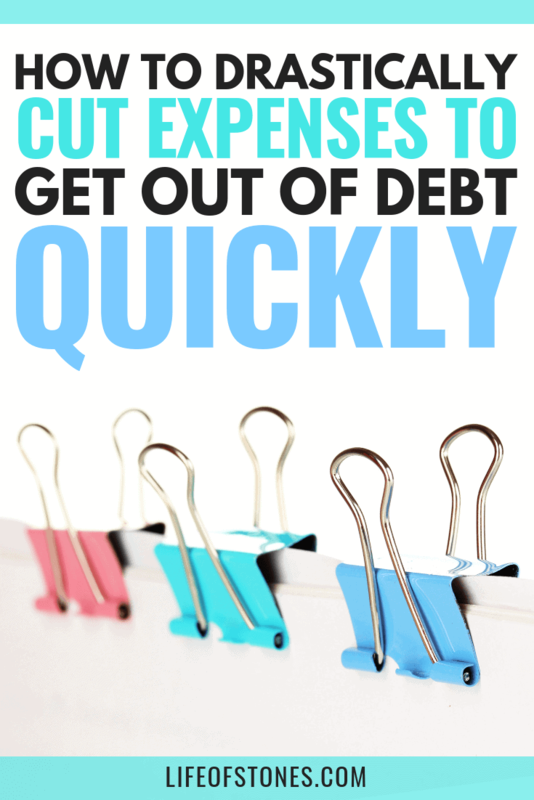 Have you cut any of these expenses from your budget already? Don’t forget to check out my new Begin to Budget Bundle to help you get started budgeting today!